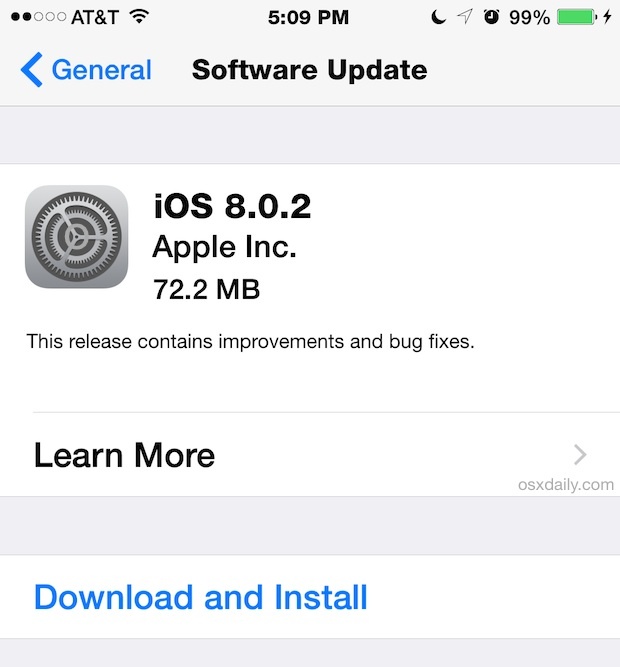 Apple has released iOS 8.0.2 for all iPhone, iPad, and iPod touch users running iOS 8. The update includes multiple bug fixes, including resolutions to problems introduced by the failed iOS 8.0.1 launch. 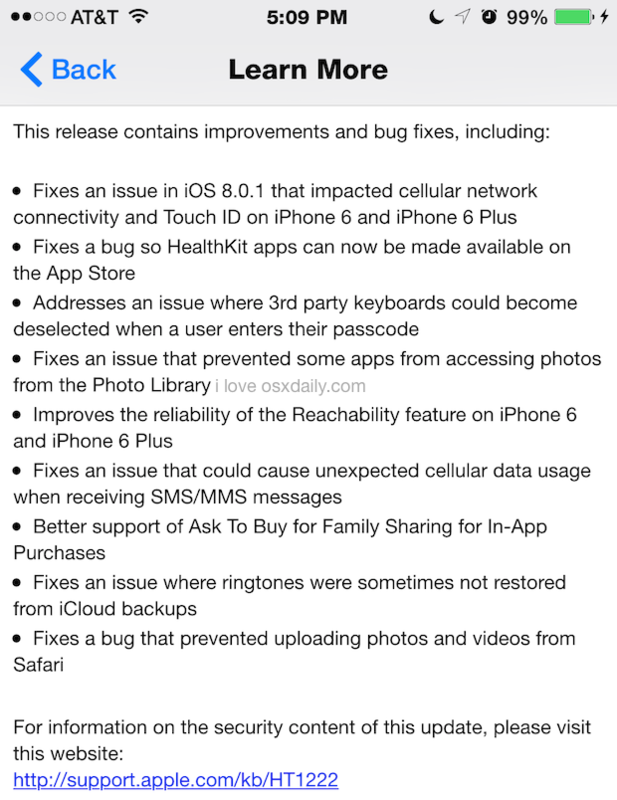 Full release notes for iOS 8.0.2 are included below. The simplest way for users to update to iOS 8.0.2 is through the Over-the-Air update service offered directly on an eligible iPhone, iPad, or iPod touch. The download is about 72MB and installs quickly. Be sure to backup your iOS device before installing this or any other software update. Users can also find the update available through iTunes by connecting their iOS device to a computer and choosing “Update”. Each firmware file is several GB in size, depending on the device. Release notes span all supported devices, though obviously some updates only pertain to some hardware. Notably, there is no specific mention of wi-fi trouble or battery drain improvements, but it’s possible that resolutions to those complaints have also been included in the release. All users are recommended to install the iOS update, though given the concerns with iOS 8.0.1, it’s understandable if users were to wait a while. User reports regarding updating to iOS 8.0.2 so far indicate the release is trouble-free. I’m not gonna be a guinea pig. I’ll wait a week or two. Apple sure has lost that “It just works” quality in their stuff. Billy G is laughing all the way to the bank, and whats his name, um, Steve Jobs, is spinning at 10,000 RPM in his grave. As long as you backup first you should be fine, though I think many people are going to hold off an hour or two for obvious problems. The ‘No Service’ issue with iPhone 6/+ surfaced immediately on Twitter, so I imagine any major issues with iOS 8.0.2 would as well. I downloaded it. Having to restore, my WiFi is spotty and my Health app stopped working correctly. I think Apple should start looking for a new QA manager. Booted my iMac OS 10.9.5/iTunes11 and it doesn’t see my iPad Air via Wi-Fi. I had to plug the iPad Air into the iMac for iTunes11 to see the iPad Air. iOS 8.02 installed successfully, but it has not corrected the issue between iTunes11 and iOS 8.02. This issue DOES NOT effect web surfing via Wi-Fi on my iPad Air. The issue is only that iOS 8.02 drops the ability to see my iPad Air device via Wi-Fi in iTunes11, thus there is no syncing via Wi-Fi. Quitting iTunes11 & rebooting the iOS8.02 iPad Air re-established the ability for iTunes11 to see my iOS8.02 iPad Air device, but it’s only temporary as overbite the connection will be lost. This never occurred w iOS7. Really?! That’s all I hear from my Samsung phone people. Carrier bloatware, unstable and unpredictable, bad radios, bad voice quality, broken screens, ever-mutating google software, spyware… it never ends. Wish they would hear me for a change and get a phreaking phone that works. OK, so if everyone waits to upgrade, how are we going to know if 8.0.2 really works? Just sayin …. Reminds me of Yogi Berra: “The stadium is so crowded nobody goes there anymore”! This may be cute, but it also takes undercuts my confidence in anything posing as information on this site. Are you here for entertainment or serious information? IOS 8.0.2 is one big problem for iPad. I downloaded IOS 8.0.2 on my IPad Air, IPad 3 and IPad 2. And it’s terrible! On the Air and 3 games that use to work won’t work and Safari is all screwed up! I’m not a happy camper. I have. 5s, which I love and wouldn’t give up even if the 6plus was free. I downloaded the 8 update, then 8.0.2. Now when I try to open my contacts through the Icon it closes. I gave to go to my phone and go yo contacts from there. Other than that, everything is ok. It also did this to my iPad Air. Any suggestions. My phone is only 8 months old. Just wanted to let you know that I upgraded my iphone5 and ipad3 to 8.0.2 successfully and cannot replicate any of the issues mentioned by other users. Everything looks a little smoother than 8.0.0 where I had been getting the occasional app crash out (but nothing critical) and visual glitch on the iPad. Overall I am not seeing a massive speed difference from ios7 and like the upgrades to safari and predictive text/new keyboards. I did the phone OTA and the ipad via iTunes (this took quite a while but is an older device). Do back up to itunes first!